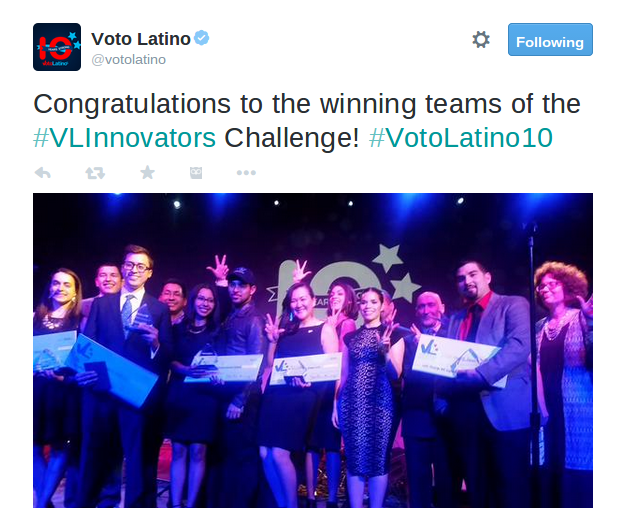 Congratulations to the young winners of the Voto Latino Innovator's Challenge! Did you know about this contest? Latino youth ages 18 - 34 were challenged to think of a way in which technology could be used to make life better for Latinos. There were seven winners this year and all but one of them focused on the development of apps to help our community. From using tech to help improve the health of migrant workers to helping young Latinas suffering emotional difficulties to helping DREAMERS find scholarships, I love how the ideas presented solutions to real-world problems. The seven winning teams will split $500,000 in grants. The judging team included high profile Latino activists Rosario Dawson and Wilmer Valderrama. If you'd like to learn more about the winners and their amazing ideas, click here. Have you ever asked your child to identify problems in the world? Do you challenge your children to think outside the box and find solutions to these problems? I'm putting it on our school schedule. I want my kids to regularly think about how they can contribute to our society and help others be seeing their needs and finding creative solutions.